Speaker: Ryan Egeland, MD PhD MBA, Senior Director of Business Development & Licensing, Medtronic, Inc.
Caltech incubated early technology which is now transforming clinical practice. Much of “precision medicine” began in Caltech laboratories. Many “big data” applications in medicine began with combinatorial chemistry, solid state oligonucleotide synthesis, image analysis, spatial multiplexing, biostatistics, robotics, and automation. But it has been a long path from scientific discovery to the patient bedside. The science had to be replicated then applied to the real (and surprisingly unscientific) world of clinical practice. Then, clinical prototypes needed to become surrounded manufacturing, sales, marketing, distribution, and quality systems – in short companies – to become real products to significantly impact significant patient populations. This has taken decades. It is this last component – the company – that may be the most mysterious, yet simultaneously most important, to junior scientists and engineers beginning their careers. Medtronic owes its success to advances in technology which became products such as the pacemaker that are now integral to practice. The mantra is familiar. Basic science leads to technology. Technology leads to a startup. Startup becomes a big company. Less intuitively however, history demonstrates also the reverse. From James Watt to Medtronic, commercial practicality can also generate basic science breakthroughs. “Being a scientist” and “being in industry” are not mutually exclusive. This seminar will explore this intersection between science, technology, and commerce – and the breathtaking role engineers, in particular, will have in transforming modern medicine. Senior Director of Business Development & Licensing, Medtronic, Inc.
Ryan Egeland is Senior Director of Business Development & Licensing at Medtronic, in the Early Technologies Group, where he is focused on strategic mergers and acquisitions. In his current role Ryan is responsible for identifying novel intellectual property, technologies, and companies that fulfil Medtronic’s mission of contributing to human welfare by the application of biomedical engineering to alleviate pain, restore health, and extend life. The Early Technologies group is the highest growth business in all of Medtronic. Ryan delights in building lasting relationships between Medtronic and early startups as well as with scientists, students, and leadership at academic institutions such as Caltech. 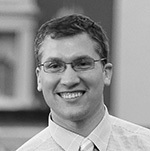 Ryan Egeland has enjoyed a career where he has connected the dots between clinical, scientific, and commercial realms. Ryan joined Medtronic in 2012, and has since held roles in marketing, medical affairs, and now business development. Prior to joining Medtronic, Ryan practiced medicine after training as a plastic and reconstructive surgeon at Northwestern. He received his MD with honors from Harvard Medical School. Prior to his medical career, Ryan co-founded Oxford Gene Technology; as a result he was named one of the top 100 innovators in the world by MIT Technology Review in 2006. Ryan holds a PhD in a biochemistry and engineering from the University of Oxford, where he also completed an MBA as a Rhodes Scholar. Ryan began his scientific career in the laboratory of Sir Edwin Southern, who invented the “Southern Blot” and DNA fingerprinting. In that laboratory Ryan designed the first electrochemical method of DNA microarray fabrication on silicon dioxide wafers (commonly known as “DNA chips”). He attributes his early scientific success to intensely multidisciplinary scientific work. He describes the laboratory as formative to his entire career. He now is applying that experience to the “bench to bedside (to big business)” transformation now known as “precision” medicine. Ryan played football as an offensive lineman at Colorado College where he was an NCAA All-American. He lives in Minneapolis where he treasures spending time with his wife Jennifer and baby girl Ada.